WHAT IS THE GREAT FOOD RESCUE RACE? A foot race with food and food rescue challenges through the Adelaide CBD. An afternoon of food, fun and team building, while making a difference to vulnerable people in greater Adelaide! Start/Finish Line and Event Hub in Victoria Square/Tarndanyangga (Southern side). The Race takes you on a route through Adelaide CBD passing iconic food landmarks, charitable agencies ad more! Teams are encouraged to raise $2,500 (or more!) per team of 5. That’s only $500 per person! OzHarvest SA provides tips and tricks to help teams achieve this. Every $1 donated = 2 meals OzHarvest can rescue from going to landfill and deliver to people in need. $275 (incl. GST) per team of 5, this includes your race day t-shirt, food, drinks & networking at the finish line and much more! The Great Food Rescue Race is a unique fast-paced race across Adelaide’s CBD embracing food, community, teamwork and fun, whilst raising funds for OzHarvest’s South Australian food rescue operations. Teams of five compete against each other in a series of cooking, nutrition and food-rescue themed challenges between Adelaide’s iconic food landmarks and charitable agencies, with local chefs and food identities making (surprise) appearances during the day. The collective fundraising goal this year is $100,000, which always sparks healthy competition amongst teams and their supporting businesses! Why should my team participate in the Great Food Rescue Race? Why is this important? The Great Food Rescue Race is an amazing team building experience and promises to be a fun, engaging, educative and epic afternoon learning about food waste, food rescue, food insecurity and other topics that fit under, or relate to, the OzHarvest purpose of Nourishing Our Country, through Food Rescue, Education, Engagement and Innovation. 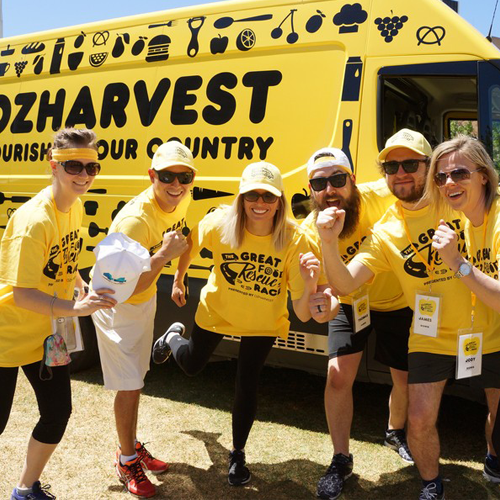 Not only will your team have a fantastic afternoon together, including some lovely celebrations in the Event Hub after you cross the finish line, your team will also collaborate to raise vital funds for OzHarvest, which helps making an incredible difference in the lives of people in need. OzHarvest is the first perishable food rescue organisation in Australia collecting quality excess food from commercial outlets and delivering it, direct and free of charge, to more than 900 charities providing much needed assistance to vulnerable men, women and children across Sydney, Adelaide, Brisbane, Canberra, Gold Coast, Melbourne, Newcastle and Perth and in various regional areas. Every $1 donated allows OzHarvest to deliver two meals to people in need. Visit our frequently asked questions page or contact us on [email protected] or call the OzHarvest office on 08 700 700 80 and ask for Sanne or Hayley.